My guests said that the fried part of my chicken calves was really good, but the actual chicken itself was a bit ‘uncooked.’ The outside portion of chicken that was cooked all the way through was juicy from being soaked in the buttermilk overnight, but it was hard to eat those pieces when the inside of the ‘chicken calf’ was pink. 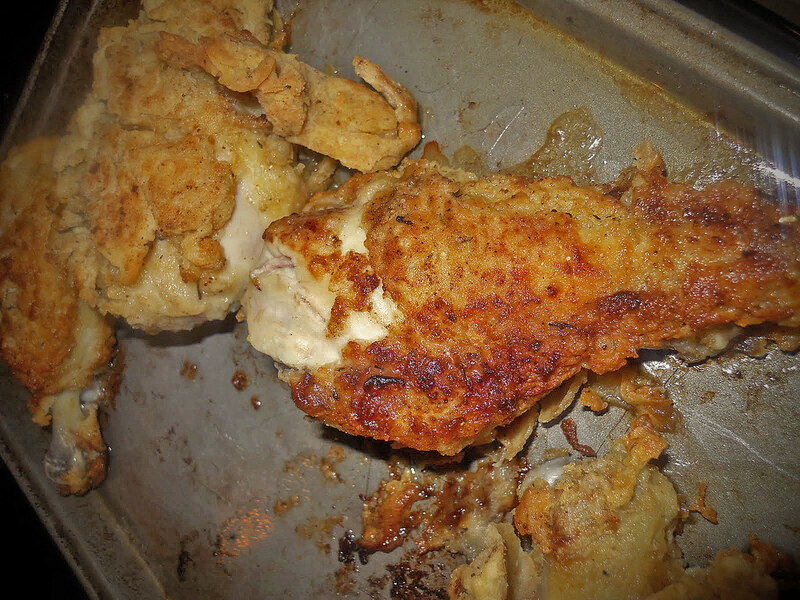 For my crispy tasty crust – I used paprika, cayenne, garlic salt, pepper, and salt in the flour that coated my chicken. To be honest, I have made baked chicken fingers with the same seasoning before, so I knew it would taste yummy. I wasn’t too upset about my friend’s comments because I personally thought a lot worse of my poor fried chicken calves. 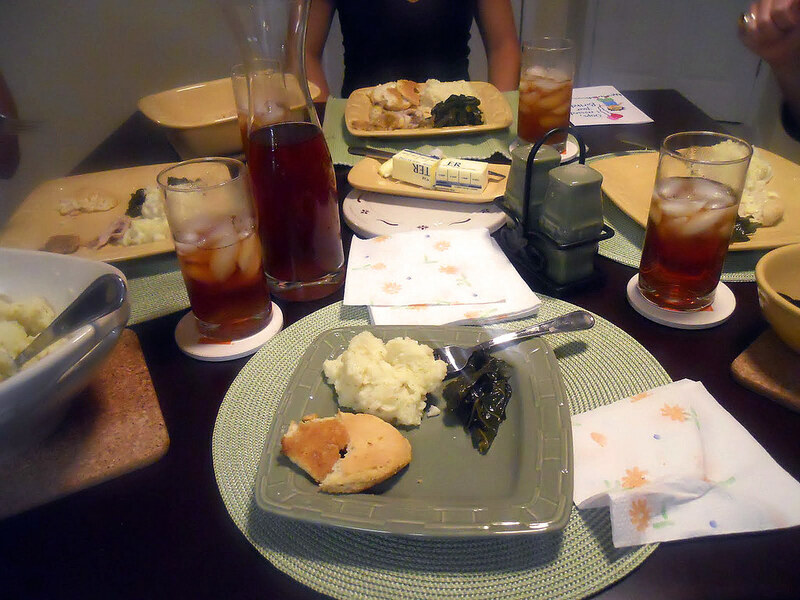 My collard greens and mashed potatoes were pretty amazing, as were my biscuits and sweet tea! I opted to do vegetarian collard greens because of my pork-sensitive tummy. I added vegetable stock and a lot of hot sauce to spruce them up, and my guests loved them! My mashed potatoes were mashed with whole milk, butter, and garlic salt to taste. My buttermilk biscuits were made using my husband’s Mawmaw’s secret biscuit recipe. And my sweet tea: I used cold brew tea bags and a TON of sugar – the recipe was not from the side of the tea bag box, but told to me by my husband’s Grandmama Sharon. I’d like to try fried chicken again sometime soon – but this time I’ll call Mawmaw for her recipe instead of relying on the recipes I read online. She is a true Tennessee lady who makes the best fried chicken I’ve ever had. As for this Yankee – let’s just say the chicken won. 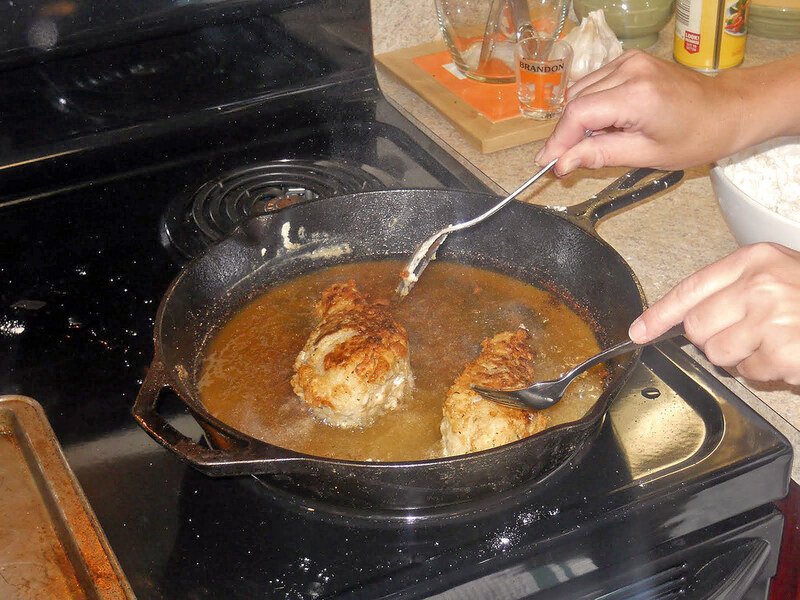 If you’ve never fried chicken before try Alton Brown’s Fried Chicken recipe and method. It’s super easy and very straight forward. The secret is to make sure you’re using a fryer chicken. 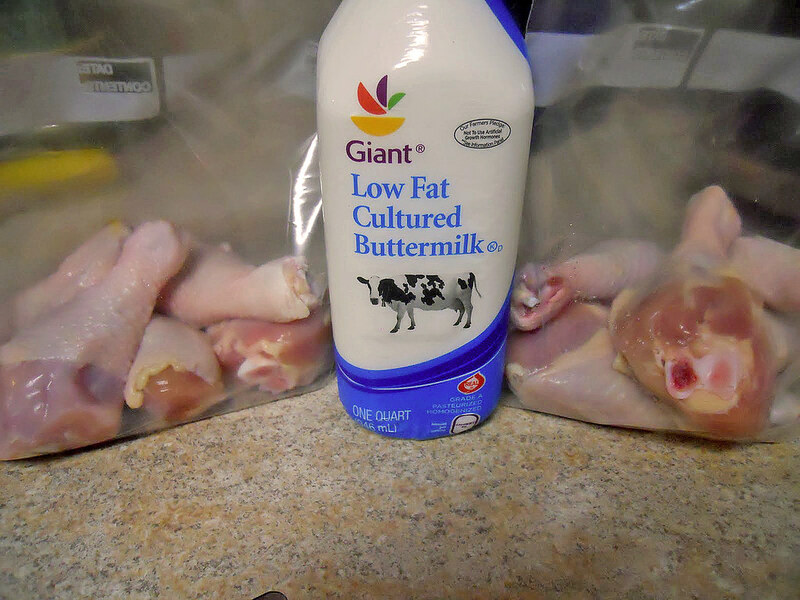 The larger chicken that comes broken down and prepackaged is usually for baking and will more than likely come out raw in the middle when fried. Also make sure you use a meat thermometer so you will know when your chicken is down right at 180 degrees in the thickest part of the meat. Stay Hungry Y’all! Wow never thought you would be beaten but I guess it happens to the best of us. I am sure the side dishes made up for the lackluster chicken I look forward to your next try on this. And that is why I leave frying to restaurant kitchens. Such a mess, and my yankee blood has little chance of success. But solider on in your worthwhile challenge! I’ve heard of people using the baking chicken, but instead of frying first then baking, you can bake then batter it and only fry it long enough to make a delish crust. Good first attempt! when you gonna fry up some tofu? Fried chicken is daunting even to those of us who grew up watching our grannies over a wood cook stove 🙂 You’ll get it next time! Well the chicken looks really whether or not it was cooked all the way. ALSO those collard greens sound amazing! This meal needs to get in my mouth! Fried chicken is simple, just not always easy. I wish Myra was still with us. I would fly her up there to teach you some old school southern cookin’ that would slap the taste out yo mouth! Her chicken was truly finger lickin’ good! I thought the meal was amazing! What a great evening of great company & great food! Couldn’t get enough of the yummy dishes. Thank you for introducing me to the best collard greens and mashed potatoes I’ve ever eaten! And, when it was all said and done, the fried chicken was yummy and we ate it 🙂 Can’t wait to see what you whip up for the next challenge! I think you are being a bit hard on yourself. The mashed potatoes were great…. You can blame the chicken on Giant. Mmmm! I think the chicken looks really juicy and you’ll get this recipe down in no time! Practice makes perfect as they say. The mashed potatoes, biscuits, and tea sound AMAZING and I wish I had a secret weapon in the south to give me family recipes. All in all, it looks yummy! !